Keeping Up With The Real Jindals of Louisiana! Jindal’s effort to drum up some publicity via this unorthodox announcement demonstrates both the attraction and the difficulty of campaigning in the era of reality television and social media-driven political coverage. The video was an attempt to portray the Jindals at home, interacting spontaneously in an intimate setting, just like a “normal” family. Why, they could have been any American family, with loving parents discussing with the kids whether Dad should pursue a new job. Except what normal family places a camera above the family table and sends the resulting video out to a national audience? It was hard not to view the kids as props in still another made-for-reality-television event. But if Jindal really wanted to make this work, he needed to steal a page from those other reality shows by going all in to make this a truly memorable event. Had I staged the event, I would have had the kids react to Jindal’s announcement by running from the room screaming, “You’ve ruined our lives – I hate you Dad!” Then Ms. Jindal would tell Bobby she had fallen in love with the pool boy and was seeking a divorce. Now that would be a video destined to go viral! This is not the first time Jindal has potentially botched a first impression with a national audience. In February 2009, in recognition that he was a rising Republican star, Jindal was tapped to deliver the official Republican response to President Obama’s address to a joint session of Congress. Alas, Jindal’s speech received less than stellar reviews in comparison to the President’s. As I noted in my blog post at the time, Jindal’s speech suffered from a poorly-chosen location: “Now compare the backdrop to a State of the Union (or equivalent) address to where poor Bobby Jindal gave his speech. He looked like he was standing in the hallway of his house. I fully expected Ms. Jindal to call him to take out the trash midway through the talk.” I also noted, however, that Jindal’s widely-panned speech was unlikely to have much impact on his political career. And, in fact, he was easily reelected to a second term as Louisiana governor. Similarly, I doubt yesterday’s rollout, no matter what you think of it, is going to influence Jindal’s presidential electoral fortunes very much. 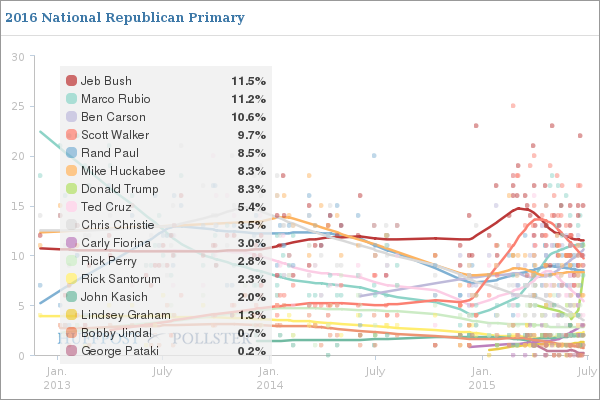 As it is, as more than one media pundit pointed out, he faces an uphill climb in an already crowded Republican field. Pollster.com’s weighted average of polls currently places Jindal 15th among 16 Republicans, with only former New York Governor George Pataki polling less than Jindal’s .7%. But no matter. Hope springs eternal. Jindal has made a career of bucking expectations. In addition to his low-tax, small government credentials, he has staked out conservative positions on a number of social issues by, for example, opposing gay marriage – positions that should play well with a segment of the Republican base. And, as the only sitting Governor in the race he is likely to try to capitalize by contrasting his own record of accomplishments in Louisiana against the legislative gridlock and partisan bickering that characterizes Washington, DC politics. He is also likely going to use his roots as the Louisiana-born son of Indian immigrants to bolster his case that immigrants should be encouraged to adopt American political ideals – another position that plays well with Republicans. Finally, I expect him to take a very hawkish line on foreign policy. It remains to be seen, of course, whether he can recapture the magic that made him a rising star among Republicans, one noted for his policy wonkishness, several years back. For what it is worth, most of the media coverage surrounding his announcement noted his low poll standings and described his candidacy as an uphill, long shot effort to break through. As I’ve noted many times before, when the media pegs you as a second-tier candidate, it becomes very difficult to climb your way to first-tier status. The Jindals’ run for the Presidency: It’s not a vacation. It’s a quest. It certainly doesn’t seem like a very rewarding experience, personally I wonder if it might be part of the staff/supporter/consultant bubble that tends to be created around presidential aspirants. If everyone you know is constantly telling you “you’re going to win Bobby!” well then you probably start thinking that you’re going to win! I feel like a similar thing happened to Hart in the 88 cycle after he dropped out. Everyone told him he could win if he got back in, so he did, even though it was a crazy thing to do. He can’t be SERIOUS? Can he? Longwalk – We’ve written about this before and I agree with you – there’s a perhaps inevitable process by which public figures gradually become encased in a bubble of “yes-people” who collectively can distort views regarding what is realistic. It is compounded, I think, by the fact that these candidates have typically beaten the odds before, so they think “Why can’t I beat them again?” In Jindal’s case, he was the first Indian-American governor who overcame significant barriers to achieve elected office. Then too, what else is left for him? He’s certainly not going to run for Governor again – at least not with his current approval ratings. Jack – I am confident that every one of the Republican candidates is serious about running to win – with the possible exception of Donald Trump! Matt, in regard to your US News & WorldReport piece, it seems too me that one important cause of the recent increase in the number of Republicans trying to be the party’s Presidential nominee is the depth of the Republican “bench”, especially their majorities of Governors and U.S. Senators. This is where most candidates come from these days in both parties. You make an excellent point. It is one I’ve talked about in the context of assessing Obama’s presidency and its impact on Democratic ranks in Congress but as you point out, Republicans have also strengthened their bench at the state level too.